In our last posting we reported that Forest Heights had responded to criticisms that their cameras were inaccurate by claiming to have conducted a thorough "independent verification", and published the results of that report in the form of a press release lifted almost word for word from the website of another town. In addition to being plagiarized and not addressing any of the specific errors reported in Forest Heights, it contained several technical errors. Go read that report, and the report on The Skeptical Juror, then come back. 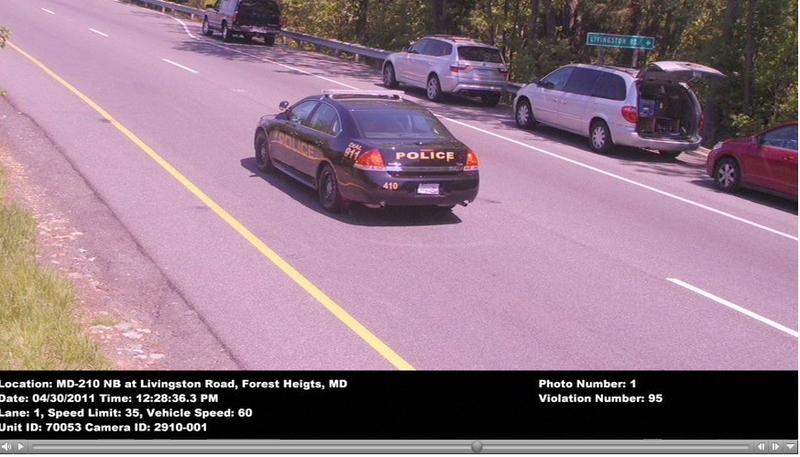 It turns out that Forest Heights did stage a demonstration of its speed cameras on April 30th, which Optotraffic used to produce a public relations video for their product (which you can see here). In that video, they inadvertently provided sample evidence which validates the technique which some drivers have been using to challenge tickets. 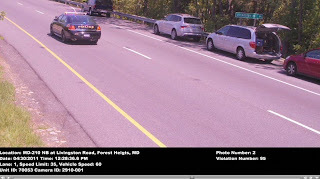 The video, like Forest Height's press release, did not address the specific details of the errors which had been reported, Optotraffic and Forest Heights officials speaking in the video only claimed that photos were not used to determine speed:"Some of the concern was that the photos measure the speed and that's not the way we measure the speed."... 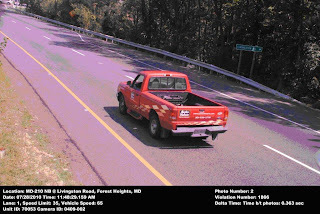 "The photos are only to show that the vehicle was there at the time and date of the violation, to get owner information, and to see that the vehicle was in motion". 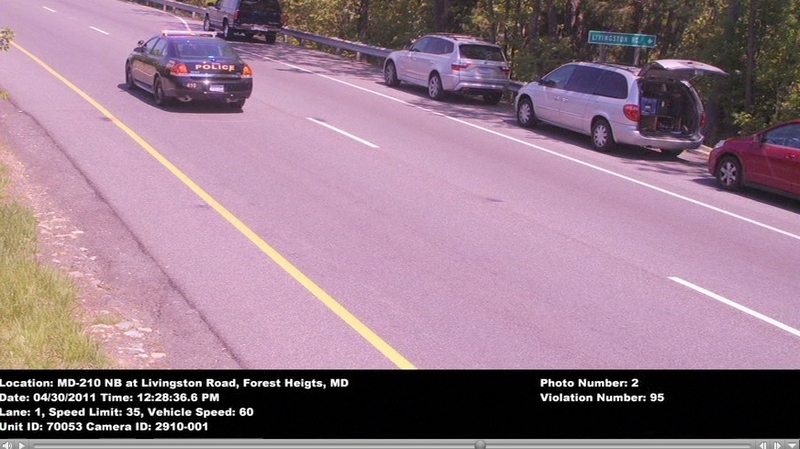 This is despite statements in their own technical document stating:“While the primary evidence for issuing a speeding citation is the calibrated Lane Sensor, the two photos provide the secondary evidence of speeding that is presented to the citation recipient.” and “Since a stationary object is present along with the vehicle, a photographic method also determines speed, guaranteeing fairness”. Those documents didn't say photos were just used for identifying the vehicle, or that the vehicle was moving. Then, after people actually started using citation photos the way Optotraffic had said they could be used, Optotraffic changed their story. The video showed this photo the following citation images of a police cruiser going 60mph, which we will take their word for it that it really is going 60mph. 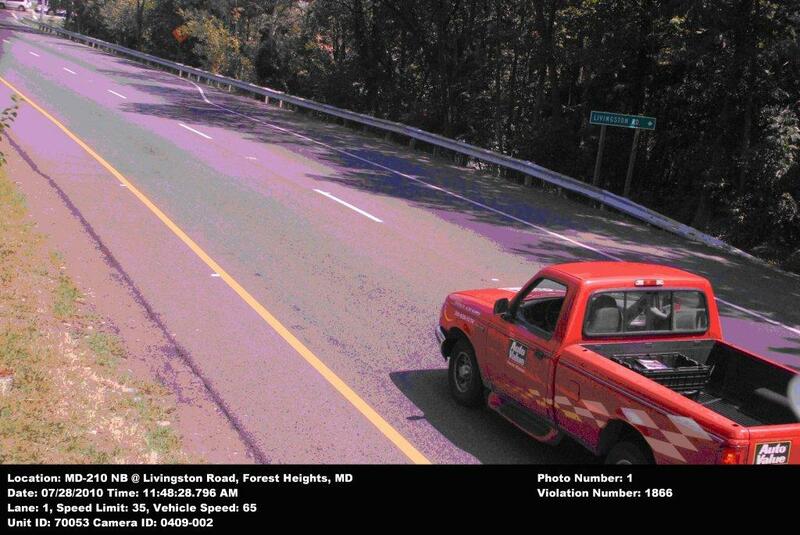 To some of the photos which have been questioned which were allegedly traveling close to the same speed. Two things *should* jump out at you. First, the police cruiser is much farther up the image than the first photo for both of the above cases. In fact, in the two examples above, the vehicle is not fully in frame in the first photo. 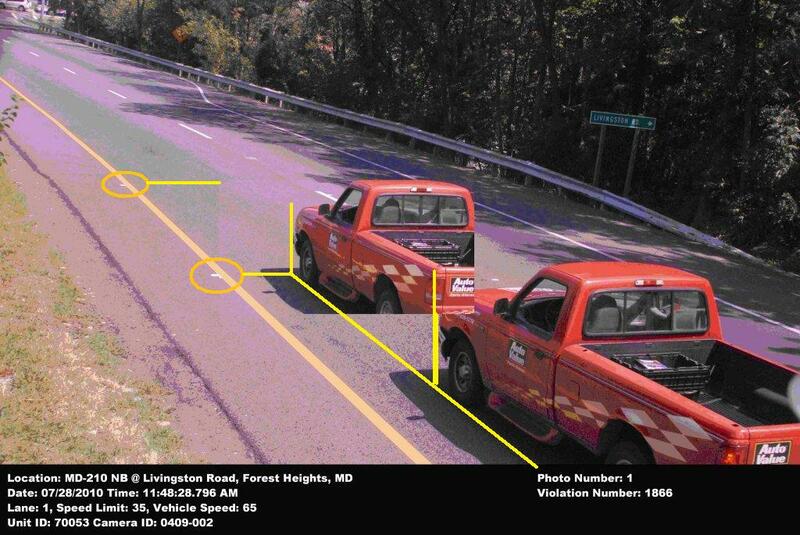 Optotraffic has stated previously that the distance from the speed sensors to the first photo is supposed to be 50 feet. So why were the cars in the challenged citations not at the same point as the police cruiser supposedly traveling the same speed? The second thing that should jump out is that the police cruiser traveled measurably farther than either of the vehicles shown in these two challenged citations. The police cruiser appears to have traveled two full car lengths. The other two vehicles in the challenged photos, not so much. Those vehicles are almost end to end in the composite images. Another thing you can observe, is that there are distinct differences between the new image and the challenged one. First, the "Camera ID" is different. 0409-002 for the challenged photos which were taken in July and September of 2010, compared to a camera id of "2910-001 for the citations in the video taken April 30th 2011. Even though this is the same location, the hardware has apparently been swapped out. So in fact the test was not actually performed on the same equipment which most of the alleged errors were recorded on. In addition the timestamps are also very different. For the old, challenged photos, the timestamps were accurate to 3 decimal places "Time: 11:48:28:796 AM". And the second photo shows a "Delta Time: Time b/t photos: 0.363 sec". It specifically tells us exactly, to 3 decimal places, what the delta was. For the new photos from the video this is NOT the case. Timestamps are only shown to 1 decimal place, and no time delta between photos is present. Optotraffic has apparently modified the devices to show less precision in timestamps and not to present an explicit "time between frames". So the real time in the test photos could be 0.3 or 0.36. One could draw the conclusion that they wanted to provide less information to defendants, so that they cannot do what defendants were doing with their earlier photos. If timestamps are only known within 1 decimal place, it is no longer possible to provide an exact time-distance calculation because we only know times accurate to within 25 or 30 percent, errors can only be proven if the amount of error is enormous. Optotraffic now claims that citation images cannot be used to determine speed, and one might be left to think that they are attempting to make that the truth. But naah, they couldn't have made that change on purpose, right? Well, Another thing you will notice in the challenged photos, are two little white tickmarks, circled, which just happen to be exactly 25 feet apart. Those tickmarks can provide a second more precise measurement of how far the vehicle traveled (other than the length of the vehicle itself). The first is about 50 feet after the sensors, the second around 75. Well look at the circled spots on the photos from the video. You can see still "kind of" see the tickmarks, but in fact they have been painted over and are now mostly obscured (and would not be visible at all in the lower resolution images on a printed paper citation). And in fact it has been observed on the ground that the tickmarks marks have recently been obliterated. You can still see however that the police cruiser traversed a distance which is a fair amount longer than the distance between tickmarks.... the back tire has almost reached the first tickmark in the first image, and the cruiser has completely passed the second tickmark in the second image. On the older, challenged image even the front tire of the vehicle has not reached the first tickmark by the time of the first photo, and has only just reached the first tickmark in the second photo. This would be expected, if these vehicles were in fact traveling SLOWER than the 60mph police cruiser in the time interval between the speed measurement and the photos. 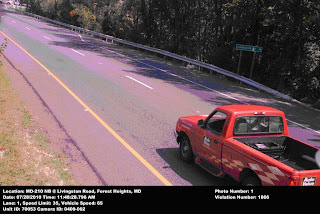 The Optotraffic video incorrectly suggests that "one person" was making these complaints, as others have made the same assertion in Forest Heights, and accuracy complaints have also been publicly made in Brentwood, Cheverly, and College Park as well. Mr Will Foreman, one of the defendants from Forest Heights, created this response to the Optotraffic video, which you can see here. 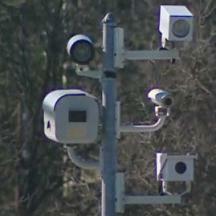 The Optotraffic video claims the cameras have improved safety in school zones. However it omits the fact that the school zones on both the Livingston Road and Indian Head Highway were created in 2010 specifically for the purpose of deploying speed cameras, and had not been signed as such previously, and in neither instance is the school for that zone actually located on the road in question. Also of note is that the video does not specifically state the area which was included in their numbers. Optotraffic also recently released a written statement. As part of that explanation they included the following:"Still photos cannot be used, and are not used, to measure speed because of built in delays in the camera mechanisms and functions including shutters. In actual practice, the time stamp and still photo of where the car is located do NOT match. Here’s why. The time stamp on the photo is generated by the computer at the actual precise MOMENT when the computer tells the camera to shoot. 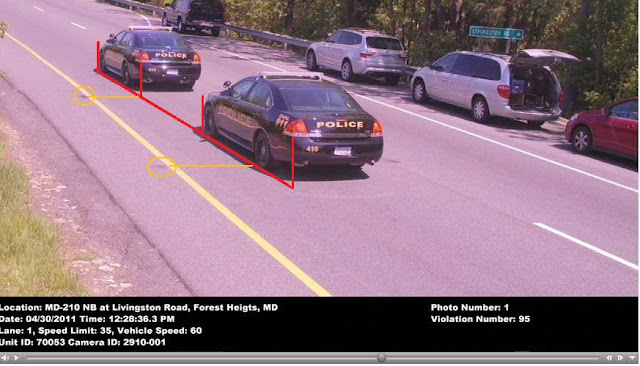 However, regarding the capturing of the actual image by the camera, there is frequently a DELAY" " [emphasis theirs]"between the time the computer delivers the command and the image of the vehicle is actually captured." 1) The photos above could only be explained by a DELAY on the first photo but not the second if the time between frames was shortened. However a DELAY on both the first and second photo would have no affect on that interval duration, and a DELAY on only the second would actually lengthen the interval. The first photo would need to be delayed but the second one . However this would means the vehicle in the first frame should be farther up the road than the expected 50 foot distance (the first tickmark), when in fact they are closer, and the vehicles are not even fully in frame. 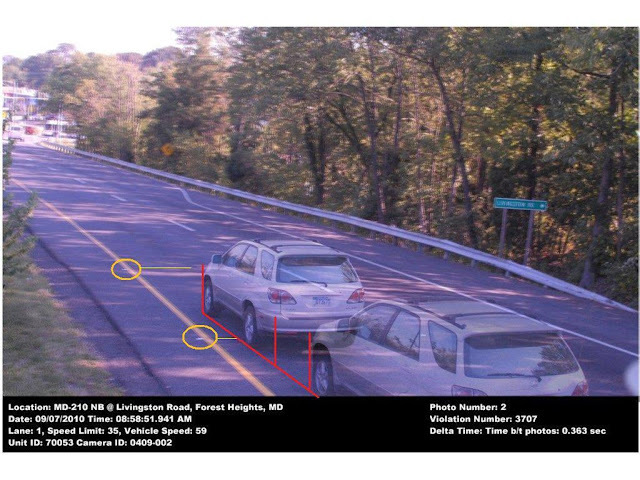 This implies that it was Optotraffic's actual intent to take the first photo a full 'car length" earlier than this -- when the vehicle would not yet have been in frame at all. 2) The discrepancy between distance traveled and the required distance in the above is huge, in the above example photos of the pickup truck the interval would need to be off by about 50%. 3) We are expected to believe that this is capable of flawlessly determining speeds with scientific precision, but that it cannot do the same with a relatively simple thing like image timestamps. 4) This explanation was not offered in any of the earlier explanations we have seen, neither in Forest Heights' earlier explanation, nor Cheverly's, nor correspondence we obtained between Optotraffic and Cheverly, nor correspondence we have received between Optotraffic and citizens of other towns who have complained. Their earlier explanations were based on vehicles braking after the speed measurement, and their explanation changed only after that was debunked.